During recent Mumbai visit I was in search of Royal Enfield Thunderbird motorcycle (having ladakh carrier with hard luggage box attach) cover because the earlier double jumbo cover I purchased was torn around pillion rider seat. I don’t know why or how it happened but maybe because motorbike was parked for weeks at open place under direct Sun light or maybe any other reason. 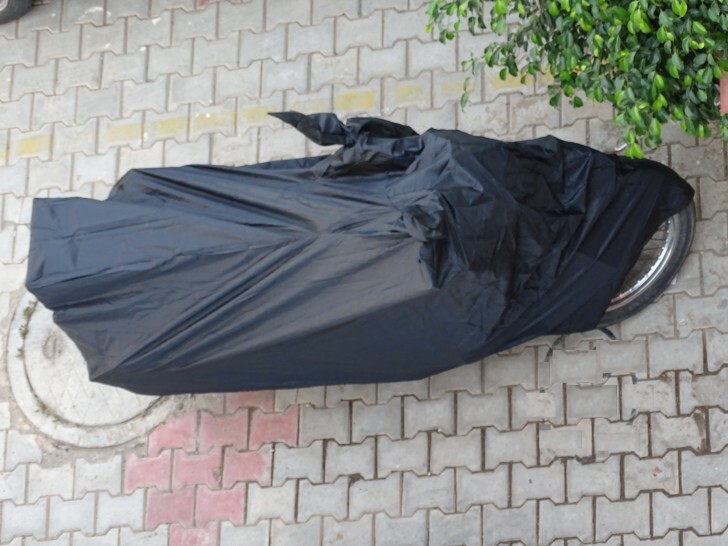 Anyway, I have to buy another motorcycle cover no matter what the reason is. And I prefer full motorcycle cover instead of handle cover, full tank cover, half tank cover. As I was inÂ hurry not having time to visit Tip Top Seat Cover Works or any other shop situated at Grant road I contacted Sharda Motors (022-32140545) situated at Goregaon (W) as he does service for Royal Enfield motorcycle and also sells royal enfield accessories. Suryakant the owner said – Yes, he is having motorcycle cover for RE. Immediately, I visited but the cover shown was not enough in length (I tried it at a parked RE motorcycle) though it was custom-made and good quality wise. Now what to do? The owner assured he will arrange bigger cover if I re-visit in few hours. And as promised he arranged a bigger size cover known as Double Jumbo Garage Cover. How much the cost? – I inquire. I know if I visit Grant road the cover might be little cheaper but thanks to Suryakant who arranged it within few hours and saved time or else I have to visit Grant road – one of the best location to purchase motorcycle accessories. As per image attach you can see how beautifully motorcycle is covered. I am satisfied. It is perfect length wise and very light weight (parachute material) – good during travel and will save from rain.